I still get rave reviews for the Kale Chips whenever I make the suckers and take them to potlucks or family functions... but easier to make, less messy and just as yummy are Zucchini Chips. I use the same sauce recipe (with adjustments for less liquids) that I use for the Kale Chips-- the 'cheezy' flavour is from the Nutritional Yeast-- the smoky undertones are from a combination of Tahini and Tamari. I use my trusty old dehydrator, but you could use your oven if you don't have a dehydrator (mostly just less eco-friendly). Cool days today are the kind of days I choose to make these chips-- I just have more energy and the house doesn't get warm from the dehydrating as it does on really hot days and nights. Have fun! *Wash and slice the Zucchini into rounds about 1/8-1/4" thick (I use a Mandoline Slicer that allows me to have the whole job done quickly and with a consistent slice). *Add all other ingredients to the Food Processor and run/pulse until smooth. Be sure to scrape down all the sauce from the walls of the processor with a spatula. 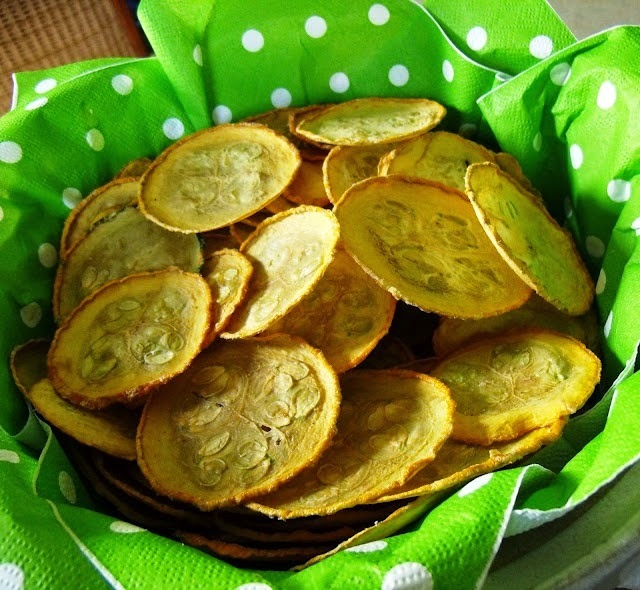 I've just tried this Cheezy Vegan Zucchini Chips, and it tasted so good. Will make more of it often. :) hanks for sharing!